With a love of learning and a genuine interest in people, Sister Mary Walker is fondly remembered by many of the students she taught and mentored over the years. Sister Mary grew up in Mott, N.D., the fourth of seven children born to the late William and Lillian (Behrenfeld) Walker. 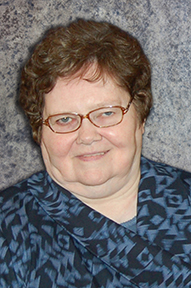 Her teachers were often sisters who influenced her life at St. Mary’s High School and Mount Marty College, Yankton, SD. An instructor at Priory High School for six years, Sister Mary taught courses in English, American history and drama. She often wrote and produced original Advent and Lenten dramas in which her students were the cast. Sister Mary was touched when several of her beloved students returned to the Priory High reunion in 2008 and shared precious memories about those dramas.